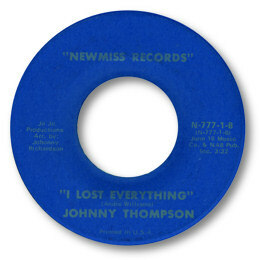 Johnny Thompson is a native of Chicago, and made his first record for Chess. “So Much Going For You Baby” is a fine straight forward blues ballad, featuring his strong gruff baritone vocals. But his next disc I Lost Everything was something else. A heavy deep soul ballad with some great chord changes and fine horn support. And is that a banjo I can hear in the background? Amazing! Johnny vocals are totally convincing. The top side “Main Squeeze” was a fair sized hit and has recently found a new lease of life on the some funk scenes. 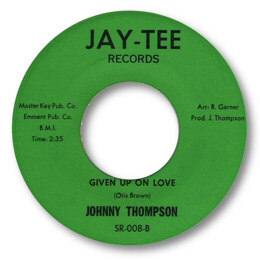 The pleasant midpaced "Given Up On Love" on his own label sadly lacks the intensity of the Newmiss 45, although the offical A side is pretty good funk. He appeared on stage with all the greats in the 60s – Bland, BB King Tyrone Davis etc – and toured for many years as a member of Bill Pinkney’s Original Drifters. Johnny now lives in Florida and unlike so many recent CDs his “Girl I Love You” is well worth seeking out.